Will the real offender please stand up—some etiquette for hostels | Where to next? English may be the universal language, but the likelihood of anyone of any nationality actually following the rules posted in a hostel is slim. Last time we were in Bishkek in 2011, a gal was washing her clothes in the sink under the sign that said ‘don’t wash your clothes in the sink’. 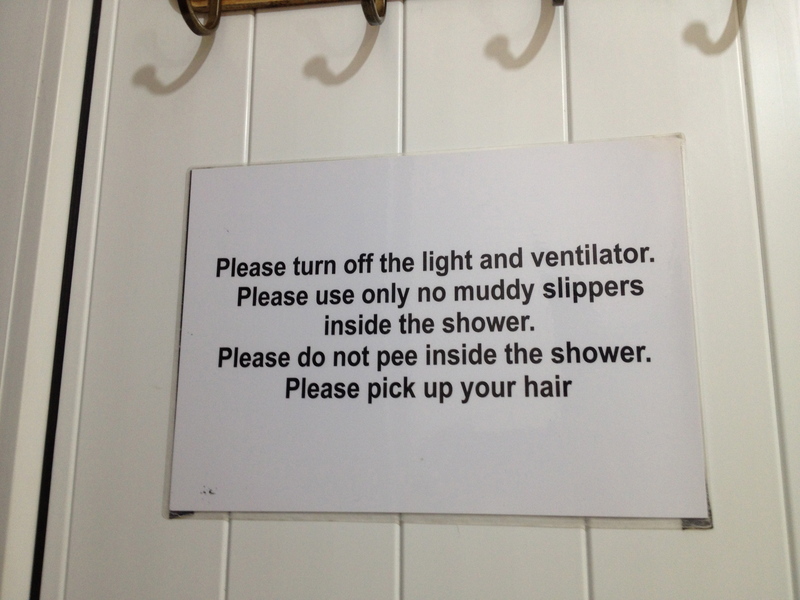 Our current hostel has a signs asking people to not put toilet paper in the toilet bowl (the pipes can’t cope), turn out lights and exhaust fans in the showers and toilets, pick up their hair from the drain, not wear muddy footwear indoors and a range of other reasonable requests. Last night, and in the space of about four minutes, I turned off lights in both toilets and showers. I also gave the (ahem) neglected toilet bowl a swipe with the toilet brush, but I didn’t pick up the gross hair on the floor. So I’ll step on my soapbox and offer a few tips on hostel etiquette. They’re all really common sense, but I reckon that too many people leave their common sense at the border. • If the sign says quiet after 11:45pm, don’t keep going at full volume until 12:30 when the hostel owner comes out to tell you off. • If you must trim your hair or beard over the toilet bowl, at least do it when the seat is up. And toss the hair from your comb or brush in the bin. • The toilet brush in the stand beside the toilet is not purely decorative. • If you use dishes, cutlery and pots and pans, wash them. Don’t walk away and expect your mum to turn up to do the job. This morning, Neil cleared the communal tables of beer bottles and dishes and then washed up a sink full of dishes. Yesterday I washed up so I could have clean dishes and a cup for breakfast and coffee. What will the residents do tomorrow after we’ve left? • Don’t help yourself to food that belongs to other people. Yesterday an Italian guy had a whole litre of milk taken. • If the hostel supplies toilet paper (many don’t), it is not your right to steal it on departure. And while I’m still on my soapbox, I’ll say more about the toilet paper of Eastern Europe and Central Asia. If you are travelling in these parts, I suggest you bring your own supply from home. If you forget or run out, buy paper in Iran. It seems to have the best I’ve seen in eight countries. Whatever you do, don’t buy toilet paper in Georgia. All the supplies bear an alarming resemblance to coarse sandpaper—in touch, texture and look. Or if you buy some, donate it to the person who leaves their hair on the toilet seat. It doesn’t just happen in Kyrgyzstan. It’s the same in hostels and caravan parks in Good old civilised Ballarat. Maybe it is that there are people and other people. So true, this behaviour happens the world over. Pity. How hard is it to use a bin ? Wash up what you have used ? Another thing……………….Fridges, if it aint yours, leave it alone !!!!!!!!!!! I recall an advertisement for “sanitary tissue” (toilet paper) in an old magazine which proclaimed as an asset “no splinters”. Apparently, some of the early American TP had fairly unsavory characteristics, too. It seems the advertisement was from the late 1920s, early 1930s, but I was unable to relocate it. ‘No splinters!’ That’s an amazing tidbit of history. Can’t wait to share it with others on the truck. Thanks. Sounds just like an Aussie caravan park. As an aside-boating today, we picked up someone elses beer bottle and brought it home (how hard is that), and then a plastic bottle-that was attached by super strong fishing line to a star picket!! Imagine if a boat ran over that and the line got caught around the motor, the picket might come through the bottom of the boat! Thoughtless pigs all over the world! It’s amazing and discouraging that so many people reckon someone else will clean up their mess. I was immediately drawn to your title, expecting another “phantom shitter” story! I will put my hand up on the pilfering of loo paper, It was part of my opening spiel, “if you actually find any, grab it”. As you mentioned, very rare! I always knew you were a toilet paper thief, but we’ll never be totally sure who the ‘phantom shitter’ was. I stayed in a few hostels in Ireland, and I concur with your soap box declarations. The hostel rules are never so bizarre as to dictate scrubbing the sink for several dozen minutes, or that you’ll have your stuff confiscated if you get mud on the floor. Their requests are very reasonable, especially to keep the place hygienically decent. Thanks for the recommendation. I’ll be sure to buy toilet paper in Wisconsin next time I’m there. And yes, hostel requests are usually most reasonable.